Coach's Corner - Mariano Rivera hand signed/guaranteed Yankees "Stats" jersey. 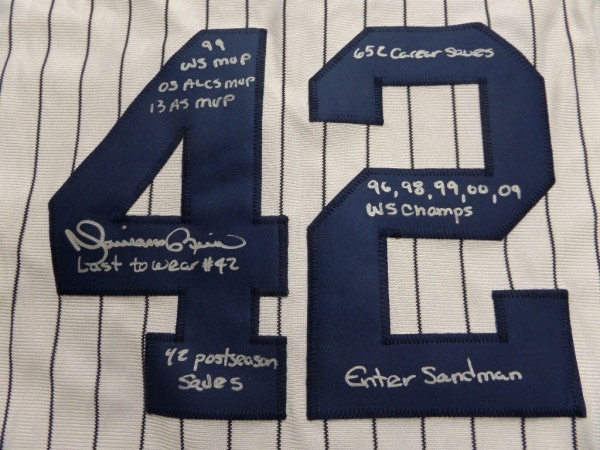 Go Back to Lot List Mariano Rivera hand signed/guaranteed Yankees "Stats" jersey. This mint home white pinstripe is well made, tagged right by Majestic, and has sewn on everything. It comes back #42 signed by the 1st ballot HOF star and in bold, clean silver paint pen. It grades a 12 on a 1-10 scale, shows off easy from 20+ feet away, and even has a slew of career stats written as a bonus. Signed in person at a NYC event, and guaranteed authentic by us forever! Can you say certain Cooperstown investment?